Phospholipase D. Active site motifs. 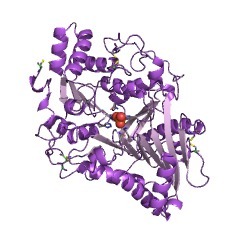 Phosphatidylcholine-hydrolyzing phospholipase D (PLD) isoforms are activated by ADP-ribosylation factors (ARFs). PLD produces phosphatidic acid from phosphatidylcholine, which may be essential for the formation of certain types of transport vesicles or may be constitutive vesicular transport to signal transduction pathways. 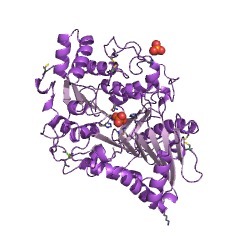 PC-hydrolysing PLD is a homologue of cardiolipin synthase, phosphatidylserine synthase, bacterial PLDs, and viral proteins. Each of these appears to possess a domain duplication which is apparent by the presence of two motifs containing well-conserved histidine, lysine, aspartic acid, and/or asparagine residues which may contribute to the active site. An E. coli endonuclease (nuc) and similar proteins appear to be PLD homologues but possess only one of these motifs. The profile contained here represents only the putative active site regions, since an accurate multiple alignment of the repeat units has not been achieved. Phosphatidylcholine-hydrolysing phospholipase D (PLD) isoforms are activated by ADP-ribosylation factors (ARFs). PLD produces phosphatidic acid from phosphatidylcholine, which may be essential for the formation of certain types of transport vesicles or may be constitutive vesicular transport to signal transduction pathways. PC-hydrolysing PLD is a homologue of cardiolipin synthase, phosphatidylserine synthase, bacterial PLDs, and viral proteins. Each of these appears to possess a domain duplication which is apparent by the presence of two motifs containing well-conserved histidine, lysine, and/or asparagine residues which may contribute to the active site aspartic acid. An Escherichia coli endonuclease (nuc) and similar proteins appear to be PLD homologues but possess only one of these motifs [(PUBMED:8732763), (PUBMED:8755242), (PUBMED:8051126), (PUBMED:9242915)]. There are 86578 PLDc domains in 45058 proteins in SMART's nrdb database. Taxonomic distribution of proteins containing PLDc domain. This tree includes only several representative species. The complete taxonomic breakdown of all proteins with PLDc domain is also avaliable. Click on the protein counts, or double click on taxonomic names to display all proteins containing PLDc domain in the selected taxonomic class. New developments in phospholipase D.
Phospholipase D: enzymology, mechanisms of regulation, and function. Phospholipase D exists in various forms that differ in their regulation but predominantly hydrolyze phosphatidylcholine. The Ca(2+)-dependent isozymes of protein kinase C regulate phospholipase D in vitro and play a major role in its control by growth factors and G protein-linked agonists in vivo. Recent studies have demonstrated that small G proteins of the ADP-ribosylation factor (ARF) and Rho families activate the enzyme in vitro, and evidence is accumulating that they also are involved in its control in vivo. 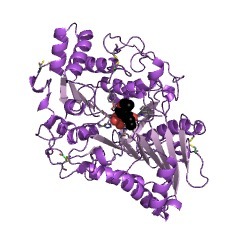 Both types of G protein play important roles in cellular function, and the possible mechanisms by which they are activated by agonists are discussed. 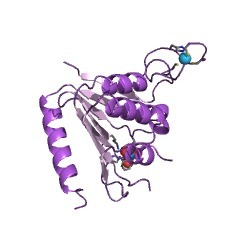 There is also emerging evidence of the control of phospholipase D and Rho proteins by soluble tyrosine kinases and novel serine/threonine kinases. 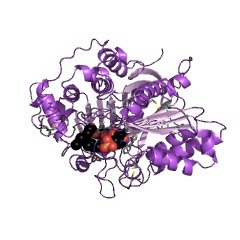 The possible role of these kinases in agonist regulation of phospholipase D is discussed. 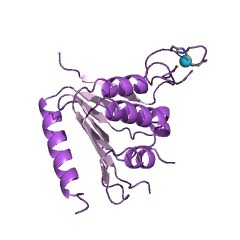 The function of phospholipase D in cells is still poorly defined. Postulated roles of phosphatidic acid produced by phospholipase D action include the activation of Ca(2+)-independent isoforms of protein kinase C, the regulation of growth and the cytoskeleton in fibroblasts, and control of the respiratory burst in neutrophils. Another important function of phosphatidic acid is to act as a substrate for a specific phospholipase A2 to generate lysophosphatidic acid, which is becoming increasingly recognized as a major intercellular messenger. Finally, it is possible that the phospholipid changes induced in various cellular membranes by phospholipase D may per se play an important role in vesicle trafficking and other membrane-associated events. A duplicated catalytic motif in a new superfamily of phosphohydrolases and phospholipid synthases that includes poxvirus envelope proteins. A novel family of phospholipase D homologues that includes phospholipid synthases and putative endonucleases: identification of duplicated repeats and potential active site residues. Phosphatidylcholine-specific phospholipase D (PLD) enzymes catalyze hydrolysis of phospholipid phosphodiester bonds, and also transphosphatidylation of phospholipids to acceptor alcohols. 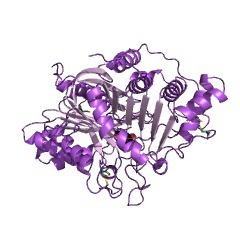 Bacterial and plant PLD enzymes have not been shown previously to be homologues or to be homologous to any other protein. Here we show, using sequence analysis methods, that bacterial and plant PLDs show significant sequence similarities both to each other, and to two other classes of phospholipid-specific enzymes, bacterial cardiolipin synthases, and eukaryotic and bacterial phosphatidylserine synthases, indicating that these enzymes form an homologous family. This family is suggested also to include two Poxviridae proteins of unknown function (p37K and protein K4), a bacterial endonuclease (nuc), an Escherichia coli putative protein (o338) containing an N-terminal domain showing similarities with helicase motifs V and VI, and a Synechocystis sp. 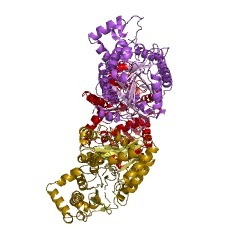 putative protein with a C-terminal domain likely to possess a DNA-binding function. Surprisingly, four regions of sequence similarity that occur once in nuc and o338, appear twice in all other homologues, indicating that the latter molecules are bi-lobed, having evolved from an ancestor or ancestors that underwent a gene duplication and fusion event. It is suggested that, for each of these enzymes, conserved histidine, lysine, aspartic acid, and/or asparagine residues may be involved in a two-step ping pong mechanism involving an enzyme-substrate intermediate. Cloning and expression of phosphatidylcholine-hydrolyzing phospholipase D from Ricinus communis L.
Phosphatidylcholine-hydrolyzing phospholipase D (PLD; EC 3.1.4.4) has been proposed to play an important role in the signal transduction pathways in animals and in various cellular processes in plants. To unravel the structure of PLD and further the investigation of its modes of regulation and cellular function, we have isolated a PLD cDNA from castor bean (Ricinus communis L. var. Hale) by using oligonucleotide probes based on the N-terminal amino acid sequence of purified PLD protein. The nucleotide sequence of the castor bean PLD cDNA clone contains an open reading frame of 2424 bases encoding an 808-amino acid protein of 92,400 daltons. Expression of this PLD cDNA clone in Escherichia coli resulted in the accumulation of a functional PLD able to catalyze hydrolysis and transphosphatidylation reactions, demonstrating that the introduction of this single gene product was sufficient to confer PLD activity and that both the hydrolysis and transphosphatidylation reactions are catalyzed the single PLD protein. Comparison of the deduced protein sequence of the clone to the N-terminal amino acid sequence of purified PLD revealed that the mature PLD protein is preceded by a 30-amino acid leader peptide. Removal of this leader peptide resulted in accumulation of non-functional PLD and also increased PLD degradation in E. coli, suggesting that this leader peptide may be involved in proper folding of PLD. The primary structure of the castor bean PLD exhibits no significant similarities with sequences of other cloned lipolytic enzymes. This information is based on mapping of SMART genomic protein database to KEGG orthologous groups. Percentage points are related to the number of proteins with PLDc domain which could be assigned to a KEGG orthologous group, and not all proteins containing PLDc domain. Please note that proteins can be included in multiple pathways, ie. the numbers above will not always add up to 100%. 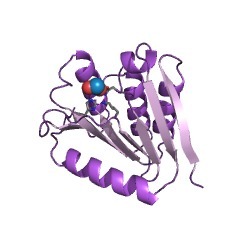 1v0r Tungstate-inhibited phospholipase D from Streptomyces sp. strain PMF. 1v0s Uninhibited form of Phospholipase D from Streptomyces sp. strain PMF. 1v0t Phospholipase D from Streptomyces sp. strain PMF soaked with the product glycerophosphate. 1v0u Phospholipase D from Streptomyces sp. strain PMF soaked with the product glycerophosphate. 1v0v Phospholipase D from Streptomyces sp. strain PMF soaked with the substrate dibutyrylphosphatidylcholine. 1v0w Phospholipase D from Streptomyces sp. strain PMF soaked with the substrate dibutyrylphosphatidylcholine. 1v0y Phospholipase D from Streptomyces sp. strain PMF soaked with the substrate dibutyrylphosphatidylcholine.